I’ve been on a pretty major brownie kick lately – I’m talking 3 different varieties in one week. I’m officially brownied out for a while, but the good news is that I’ll be sharing all the chocolately goodness with you in weeks to come. 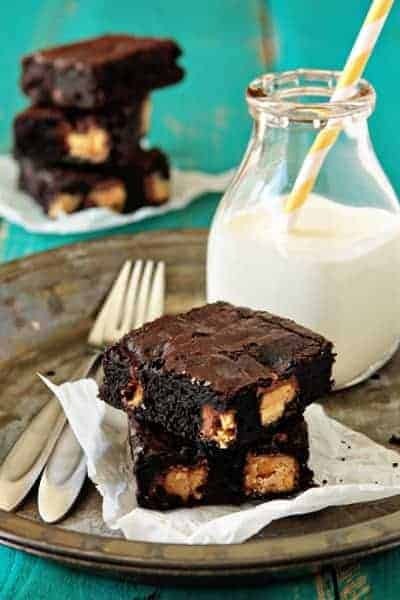 First on the list are these incredibly rich and decadent Peanut Butter Snickers Brownies. I first became aware of these little square nuggets of bliss when Amber guest posted her recipe for Peanut Butter Snickeroos. I was intrigued, they but didn’t make their way into my shopping cart until last week. I tried one as soon as I got home (purely for research purposes of course) and knew they would be bad news if I kept them in the house for too long. In fact, a certain someone was smuggling them from the kitchen and into his pockets – I found the wrapper evidence in the dryer. With a gazillion calories at our immediate reach, I decided to bake them into a batch of brownies and pass them along to my dad, brother, and mom’s boyfriend. Knowing full well they couldn’t resist noshing down on deep, dark chocolate brownies flecked with chunks of Peanut Butter Snickers deliciousness. Well, they were a hit. My dad actually hid his and rationed them over two days, so the vulchers (co-workers) didn’t wipe him out with one pass of his desk. These brownies are rich, decadent and have the perfect chewy texture. So sure, they may be calorie bombs. But they’re worth every extra step on the treadmill, I swear. Plus, since they’re so rich, you don’t have to have a big serving to satisfy any intense chocolate craving you may be having. Looking for more Peanut Butter and Chocolate Bliss? 1. Preheat the oven to 350 degrees. Line a 9" x 13" pan with foil and spray with non-stick cooking spray. 2. In a saucepan over low heat, melt the butter, add sugar and stir to combine. Continue heating mixture just until it's hot (about 110°F to 120°F), but don’t let it bubble. It should get a shiny appearance as you stir it. According the lovely bakers at King Arthur Flour, heating this mixture a second time dissolves more of the sugar, which will create a shiny top crust the brownies. 3. While the sugar heats a second time, crack the 4 eggs into a bowl, and beat them with an electric mixer on low speed and add in the cocoa, salt, baking powder, espresso powder, and vanilla until the mixture is thoroughly incorporated and smooth. 4. Add the hot butter/sugar mixture, stirring with a wooden spoon until smooth. 6. Spoon half of the batter into the prepared pan. Place an even layer of Peanut Butter Snickers onto the brownie batter. Slightly push the Peanut Butter Snickers into the batter. Top with the remaining batter and smooth the batter to cover the Snickers pieces. 7. Bake the brownies for about 30 minutes. The brownies should feel set on the edges, and the center should look very moist, but not uncooked. Remove them from the oven and cool completely on a rack before cutting and serving. - I used Hershey's Special Dark Cocoa Powder because I was out of Dutch-process. The results were delicious. I would not recommend using regular unsweetened cocoa. - Not a fan of Peanut Butter Snickers? No problem. Sub in another candy bar like Almond Joy, regular Snickers, Twix, Reese Cups, etc. Oh my…they are so deliciously dark looking. The recipe looks fabulous! I don’t even need to say more, one look says it all. Your pictures are INCREDIBLE!! Gorgeous! These brownies sound like pure heaven! I would gladly run and extra 3 miles for a couple of these little guys! Oh my goodness. Snickers are my favorite and combined peanut butter and brownies? Yes, please. Awesome! I’m going to have to try the Almond Joy version of these – I think my fiancé would melt on the spot! And I am SO with you on the Special Dark cocoa: favorite thing ever :) Great recipe!! Oh my stars and stripes I’m drooling!! Making these tonight! Oh, dream dessert! Have you not hit on everyone’s favorite flavors! Wow… These look great! Not only do the brownies sound and look delicious, I love your photo styling! My man loves a good snickers bar! These look awesome! Oh my. They look great – just the way I like them. And snickers YUmo!! I dont know why I read these types of post BEFORE I start my work day. I get NOTHING done! All I do is dream of the end of the day when I can run from my home office into my kitchen and start baking something wonderful while inspiration is hot and I’m starving. Curious question though: What do you do with all of the baked goods you make every day? Does the family just eat them all in a day knowing another amazing creation will end up on the table tomorrow? I’ve so wondered about that with Foodies who bake and cook every day but aren’t selling or giving everything away. Can it all just be frozen? Oh goodness…we think we NEED these. Like no choice in the matter, these need to get made ASAP. Seriously? Are there people who aren’t into Peanut Butter Snickers? Because I’m not sure I can live in that kind of world. ;) Looking forward to trying the twice-heated butter/sugar mix! Oh my gosh. These look like they are to die for! It’s either the brownies or the cookies…you pick! :) Love you! These look fantastic! It is no longer safe to read your blog on an empty stomach. peanut butter and chocolate…what more could you possibly need? These are fabulous! They do look rich and decadent. I wouldn’t be able to stay away if they were in the house…. These look decadent… which means amazing… which means delicious. Can’t wait to try!!! 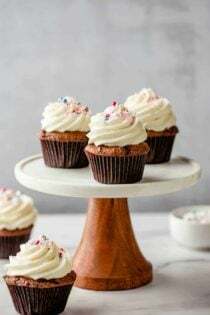 These look delicious and so fudgy! I’ve pinned this for future reference because, well, I need these in my life. Big time. I made a batch of these last night for my hubby to take to work. He said they were gone before 10:00 AM and his co-workers want another batch for next week!!! Really delicious (of course, I had to sneak one before they were sent off!). I love the brownie texture since I really dislike cake-like brownies. Thanks for another great recipe! Please, please, please tell me where I can find those little milk jars! I have no choice but to make these first thing in the morning just so I can stop dreaming about the brownies. Amazing! All of the milk jars on MBA are vintage jars and were purchased at flea markets. I would recommend checking Etsy or Ebay. Have a great day and thanks so much for stopping by. Still, it smells really really good! Ok, this may sound stupid, I can’t find Dutch process cocoa! I’ve checked whole foods,Kroger, Walmart, and the fresh market….any idea what stores carry it, or am I gonna need to buy it at amazon? I was just able to locate it at my locate market, but I typically order it from King Arthur Flour. I’m sorry, but what do you mean when you say to heat the sugar a second time? Do you let the mixture cool and then put it on the heat a second time? Thanks for all the great recipes. You do not need to put the mixture on the heat a second time, the second time refers to the baking time. I hope this helps. 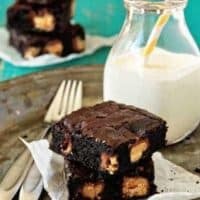 I’d love to make these peanut butter snickers brownies for my family New Year morning. Do you think it would be possible to make this the 30y, let it cool and then seal up and then reheat New Year? Hi Robin – The brownies are best the day they are made, but should last for 2 days in an airtight container. Happy baking! Fantastic photo, and amazing looking peanut butter snickers brownies! I am obsessed with brownies! I’ll definitely try it! Thanks a lot for sharing! Thanks so much for stopping by, Kara! I appreciate you taking the time to comment. Happy Baking!